Most Australians respect and regard Anzac Day as special and honour the memory of those who served and paid the supreme sacrifice in what they believed was their duty to God, King and country. And most Aussie families have their own individual remembrances whether in war or peace, of special events or occasions. June 7 is such an occasion for the Booth family as it marks the death of Private Henry Booth killed-in- action at Villers-Bretonneux in France on June 7, 1918, one hundred years ago tomorrow, Thursday. 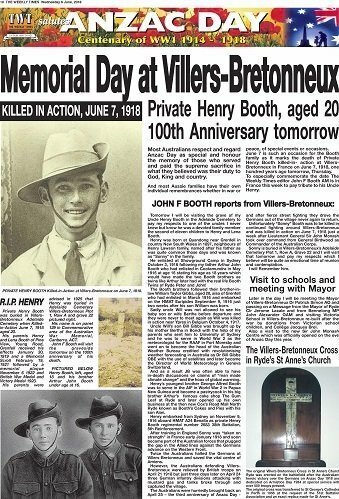 To especially commemorate the date The Weekly Times editor John F Booth AM is in France this week to pay tribute to his Uncle Henry. Tomorrow I will be visiting the grave of my Uncle Henry Booth in the Adelaide Cemetery to pay my respects to one of the uncles I never knew but know he was a devoted family member the second of eleven children to Henry and Lena Booth. Henry was born at Quandong near Grenfell in country New South Wales in 1897, neighbours of Henry Lawson family, named after his father as was quite common those days and was known as “Sonny” in the family. 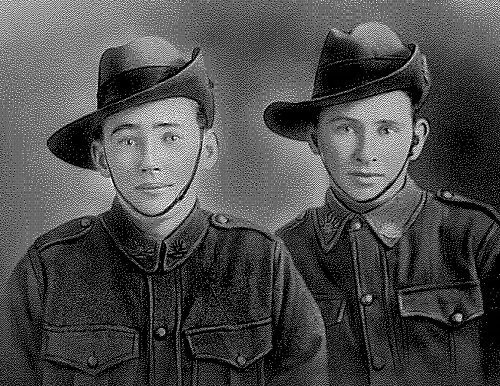 Henry Booth, left, aged 18 and his brother Arthur John Booth under age at 16. He enlisted at Showground Camp in Sydney October 3, 1916 following my father Arthur John Booth who had enlisted in Cootamundra in May 1916 at age 16 stating his age as 18 years which would have made the two Booth brothers as twins like Arthur later had with the real life Booth Twins of Ryde Peter and John! The Booth brothers followed their brother-in-law William Taylor Gibbs, aged 20, also of Grenfell who had enlisted in March 1916 and embarked on the HMAT Euripides September 9, 1916 just two weeks after his son William was born. Sadly uncle Will was not allowed to see his baby son or wife Bertha before departure and they were never to meet again as Will was killed in action near Ypres in Belgium October 4, 1917. Uncle Will’s son Bill Gibbs was brought up by his mother Bertha in Bondi with the help of my parents who sent him to University of Sydney and he was to serve in World War 2 as the meteorologist for the RAAF in Port Moresby and went on to become the head of the Australian Weather Bureau credited with revolutionising weather forecasting in Australia as Dr Bill Gibbs OBE with the use of satellites and later became the Director of World Meteorology in Geneva Switzerland. And as a result JB was often able to have in-depth discussions on claims of “man-made climate change” and the hoax of global warming. Henry’s youngest brother George Alfred Booth was to serve in the AIF in World War 2 in Papua New Guinea and became a pastrycook in his big brother Arthur’s famous cake shop The Gum Leaf at Ryde and later opened up his own business at the then new Cox’s Road Mall, North Ryde known as Booth’s Cakes and Pies with his son Alan. Henry embarked from Sydney on November 9, 1916 aboard HMAT A24 Benalla as private Henry Booth regimental number 2683 38th Battalion, 5th Reinforcement. 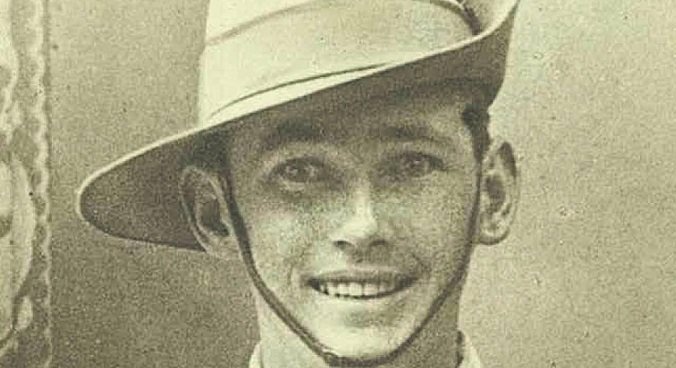 After training in England Sonny was “taken on strength” in France early January 1918 and soon became part of the Australian forces that plugged the gap in the Allied lines against the Germans advance on the Western Front. Twice the Australians halted the Germans at Villers-Bretonneux and saved the vital centre of Amiens. However, the Australians defending Villers-Bretonneux were relieved by British troops on April 21 1918 but just three days later on April 24 three German infantry divisions attacking with mustard gas and tanks broke through and captured the village. The Australians were hurriedly brought back on April 25 – the third anniversary of Anzac Day – and after fierce street fighting they drove the Germans out of the village never again to return. Unfortunately Sonny Booth was to be killed in continued fighting around Villers-Bretonneux and was killed in action on June 7, 1918 just a week after Lieutenant General Sir John Monash took over command from General Birdwood as Commander of the Australian Corps. Sonny is buried in Villers-Bretonneux’s Adelaide Cemetery Plot 1, Row A, Grave 22 and I will visit that tomorrow and pay my respects which I believe will be quite an emotional time of reunion and contemplation. Later in the day I will be meeting the Mayor of Villers-Bretonneux Dr Patrick Simon AO and passing on a Message from the Mayor of Ryde Clr Jerome Laxale and from Bennelong MP John Alexander OAM and visiting Victoria School in Villers-Bretonneux re-built after the war by donations from Victorian school children. The original Villers-Bretonneux Cross in St Anne’s Church Ryde was erected on the battlefield after the Australians heroic victory over the Germans on Anzac Day 1918 and dedicated on Armistice Day 1934 at special service with over 500 troops present. 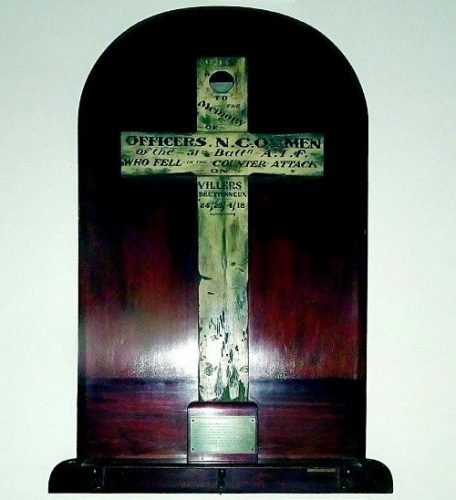 The original cross was transferred to St George’s Cathedral in Perth in 1956 at the request of the 51st Battalion Association and an exact replica made for St Anne’s.